BREAKING THE BANNER INTO PUBLIC PRESERVATION ! “This is what preservation is all about . . . ” Gordon Pettitt observed upon first seeing over 1753. 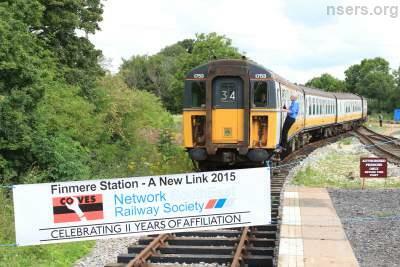 Both Chris Green and Gordon Pettitt, former Director Network SouthEast and General Manager Southern region respectively, were present to witness NSERS 4CIG unit 1753 burst through the banner into its new platform siding in Oxfordshire on Saturday 1st August. This new link between site owners COVES (Coulsdon Old Vehicle & Engineering Society) and NSERS enabled the Society to showcase 1753 newly re-coupled in unit formation after a decade of side-by-side storage at a non-railway location, safely sheeted and biding its time. 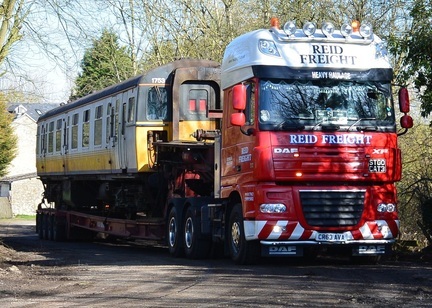 Moved in March, it now resides on railway again and is able to run within station limits powered by a Class 73 electro-diesel – and carries its first passengers since 5th February 2004, among them Gordon Pettitt and Chris Green. After a decade of conservation under high quality sheets together with electrical testing and preventative maintenance CIG unit 1753 has finally been unveiled at a railway site and run with passengers, being driven from its own cab and powered by by COVES owned ED 73130. This is a major breakthrough for NSERS – for not only is the Society custodian of the train, but its Friends of 1753 group laid part of the track and operated it themselves in a properly planned manner. Yes, we ran a train!!! Far from “rotting in a field” as so much public perception seemed to indicate, 1753's 10 year sojourn on an industrial estate in East Anglia has allowed the time lapse to do just as we intended – await the tide of railway public reaction to turn from ridicule at the idea of live electric operation to one of positive anticipation of future prospects. Regular push-pull diesel powered operation of 1753 has never been part of the plan, but we are lucky that the ED at its new home is able to turn 1753's wheels on occasion and get all the braking systems into action. Once a stray jumper pin and sticky Control Circuit Governor had been dealt with well in advance everything worked like magic and the pair operated together throughout the weekend impeccably! It was a splendid sight as we rolled back the clock 11 years and more to when CIGs were still in service operated by Connex, and 1753 eased round the curve and over the points to run into the station platform. A short run maybe, but that friendly face of an approaching CIG with a familiar headcode stirred many happy memories, as did the almost immaculate NSE moquette in the saloons (“When did you get it re-trimmed?” asked Chris Green – No, it's the original moquette!!) - with a view through the windows reminiscent of the Mid Sussex line north of Pulborough. And from outside the characteristic ring of Mark One wheels and bogies unpowered - with an added resonance of '63s – sounded just as if it was rolling up to a red, coasting slowly, trying to avoid coming to a halt . . . The sheets will be back on come the autumn - 1753 celebrates its own half century in November. Meanwhile we'll continue working towards the day when our final ambition is realised and 1753's 'LINE ON' flag clicks into place on the cab desk – and 750v DC makes the MG (motor generator) hum and compressor thump into action again . . . and the motors start to sing as the wheels turn under its own power. That may still be way in the future – but the seeds have been sown and the will is there – and the next Chapter in 1753's preservation story has begun. Passengers once more!!! A HUGE THANK YOU TO EVERYONE INVOLVED WHO HAVE MADE ALL THIS POSSIBLE ! 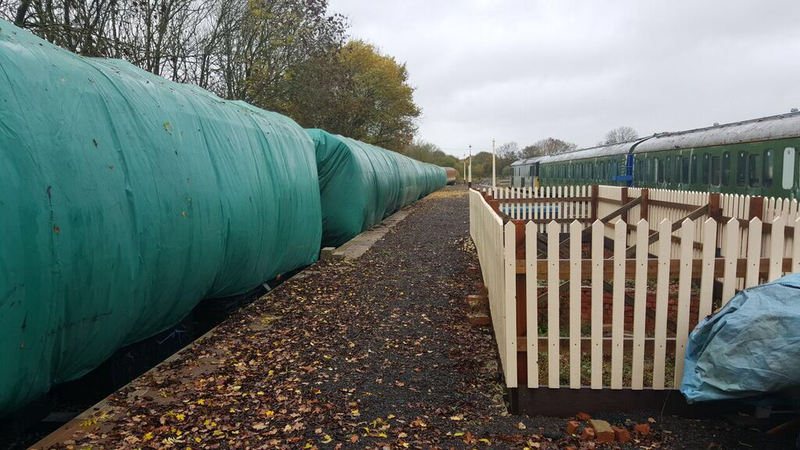 In early December 2015, 1753 was returned to it's safe covering of tarpaulin to protect her from the elements of the winter. 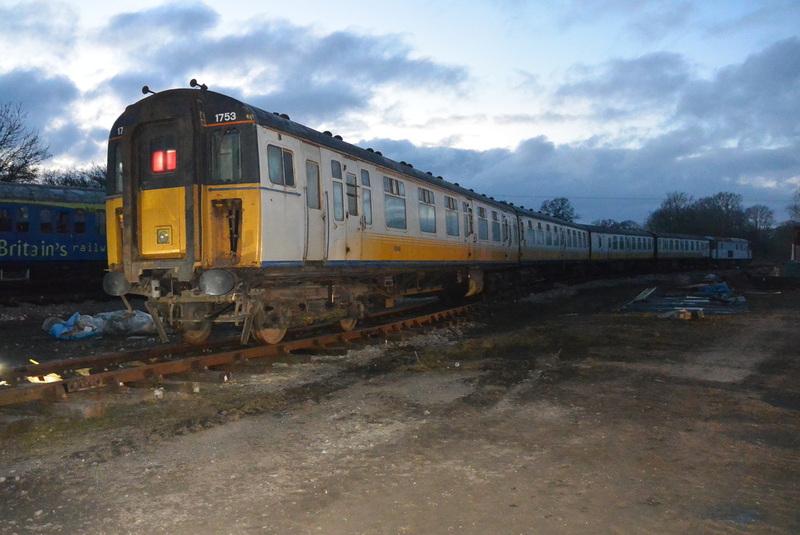 She will next see daylight again in spring 2016, in the year that NSE celebrates it's 30th Anniversary !! 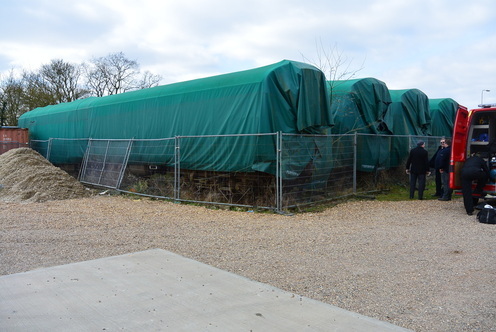 1753 now under wraps at Finmere. Photo taken by Tim Nicholson. 1753 - 10 Years in preservation, the next chapter. It was back in 2005 when an intrepid group of NSERS & COVES members assembled in a wet & cold East Anglia to lay rails & await the arrival of our newly purchased 4CIG unit 1753. Ten years on & many of the same faces, with numerous supporters who have since joined the ranks, assembled at East Anglia (thankfully during a very warm & bright weekend) during March, to witness & support the next chapter of 1753’s story in preservation. With knowledge during October 2014 from our landlord that the space ’53 was allocated was due for re-development, Neil was given the nudge that he’d been waiting for, it was 10 years that was predicted for 1753’s first chapter of mothballed conservation – who would have thought that we’d have predicted it to the nail. In the 10 years whilst ’53 has been resting, no time has been wasted, the NSERS has developed its self, winning credibility & membership with the Railway Heritage Association, Chris Green has honoured our ranks as president. 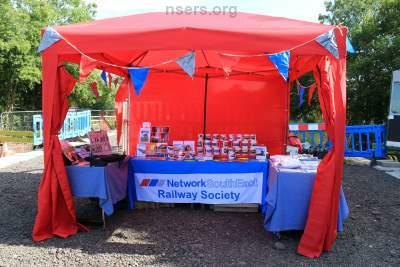 We’ve got one of the most dynamic chairmen many society’s would only dream of having (Chris Osman), and our committee & membership prove themselves time & time again by turning out promoting the society at events with the stall & working partys on either 1753 or our newly arranged project in association with the National Railway Museum to restore 2HAP unit 4308. Other notable achievements of course go on in the background with our ever developing archive which has also created relationships with train operating companies & Network Rail. Our ever updated & much envied website managed by Mark Battle & our relationship with Paul Colbeck of Anbrico Felixjaz who often provides much welcome footage of NSE period for all to enjoy & providing a financial return to NSERS. 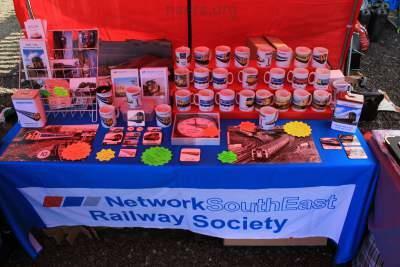 None of this could have been achieved without any of you reading this knowing that you’ve contributed time with the Network SouthEast Railway Society or Coulsdon Old Vehicle Engineering Society. So what is going on with 1753 all of a sudden you ask? 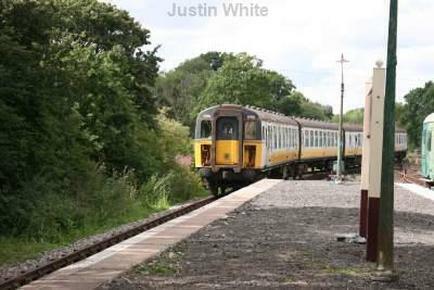 Well whilst NSERS have been busy, so too have COVES, we have been affiliated with them since the purchase of 1753, & in the last few years Peter Moore of COVES, has purchased Finmere Railway Station near Brackley. This secure private site has been returned to a usable rail friendly location with Class 73130 as resident & two ex-NSE de-icing EPB units. So once termination of residence at East Anglia was announced - we all woke up a bit sudden like. One of NSERS’s late members Roger Hedley, had donated a £15,000 legacy to 1753’s future & this kind gesture & foresight has paved the way for a much more permanent basis for ’53 to live. As the railway society has now to its name a full siding assembled adjacent to one of Finmere’s platforms with available head shunt. 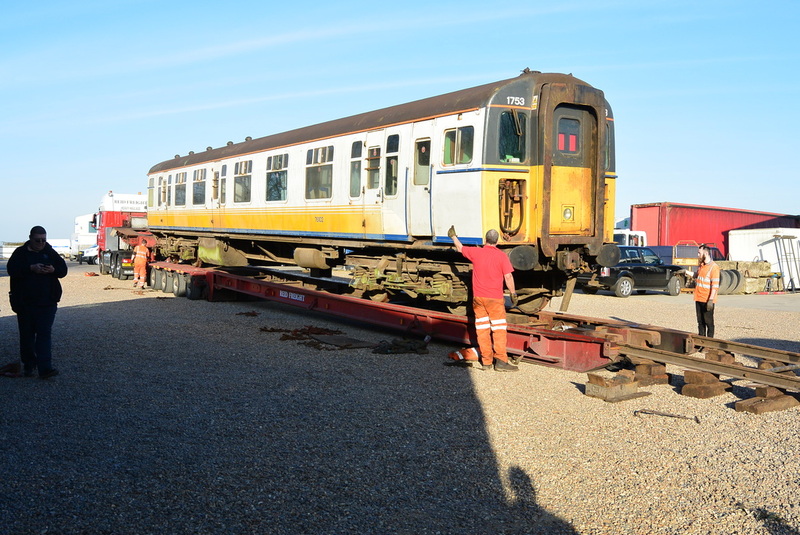 Further budget for movement & ballast etc being matched by Neil, amounting to a total budget nearing £30,000.00 – any donations towards the financial project of re-filling ‘53s contingency pot would be most welcome. Photos from 1753's move... Taken by Neil Bird. In the last four months, we have had working parties laying track, removing train components from East Anglia to new accommodation with many van loads. No time has been wasted & there is still final track work to be completed before 1753 adorns her new siding. The next chapter will be exciting, more dynamic, more accessible & well, I have to say it, coupled up & ridable! It has to be said that sheets work wonders, 1753 still feels the same as she did when she was in service 11 years ago, smells the lot! With thanks to everyone who has helped make NSERS in the last 10 years & everyone who have been working tirelessly on this project – please enjoy these photo’s & we will announce society visits to the site over the course of the next few months. Please remember that Finmere is a private site & visits are with prior arrangements only. More photos will be provided as the project completes. 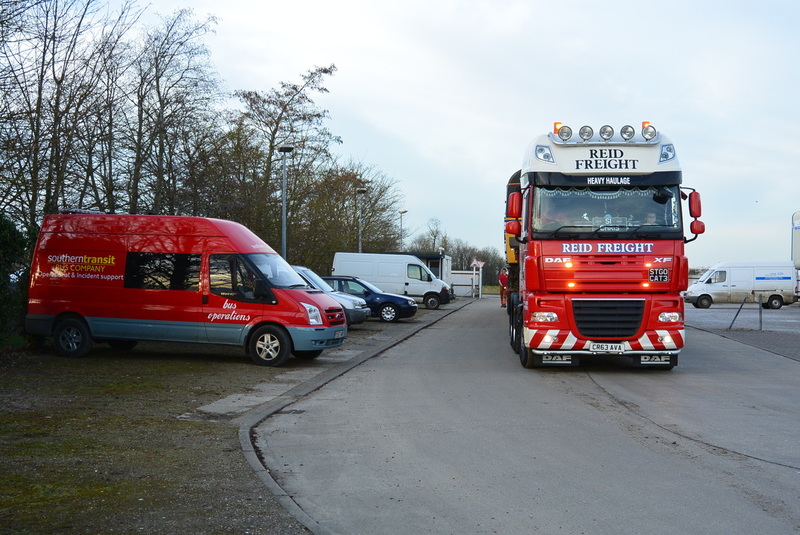 We would also like to take the opportunity to express our thanks to Reid Freight for their professional services. Their efforts were outstanding and the guys, whose humour & un-breakable determination got the whole job done within the two & a half days that we were hoping for – we are very grateful – plenty of tea always works wonders…! Please Note: The text below was written a few years ago, and is currently being rewritten to bring to up to date. Although the majority of information still is relevent, it is still displayed for reference purposes. "Brighton Line Replacement Stock" 4 Cig unit 1753 was built at York in 1965, originally numbered 7327 it was one of the first examples of the 1963 stock, based on BR's Mark 1 coach design. Entering service from 1965 onwards on Central Division mainline services, these units along with the Bigs and later Veps, gradually replaced the first generation pre-war "Southern Electric" stock. 7327 itself had a "paint date" of 29 November 1965, like all the Phase 1 Cigs outshopped in traditional unrelieved BR green, with small yellow warning panels. Allocated to Brighton Lovers Walk Depot, it entered service on the ex-LBSCR lines from London to the Sussex coast - services on which it was to remain for almost four decades. and some of these units did move to the South Eastern Division, but 7327 was to retain this feature throughout its career. This particular unit had a notably uneventful history compared to many others. Several were reformed over the years, but not this one - except for a brief period between October and November 1978 when its motor coach was temporarily exchanged with a defective example from Big (buffet) unit 7042 in order to keep the latter in service whilst repairs were undertaken. 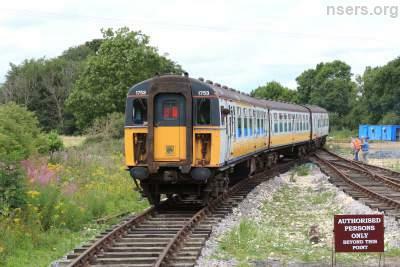 As such 7327 never ran in this form and returned to original formation the following month. In common with all rolling stock of such vintage, the Phase 1 Cigs - unlike the later Phase 2s - were built with blue asbestos insulation. Once the lethal nature of this material was realised, a removal program was instigated. Most units were dealt with at Eastleigh, but 7327 was one of a small number diverted to Wolverton, being incarcerated between August 1985 and February 1986. Unlike Eastleigh, Wolverton did not replace the original blue formica interior panels with a bland off white substitute. Thus these units retained an extra touch of originality - a significant factor in subsequent decisions with regard to choosing a unit for preservation. but following the creation of Network SouthEast in 1986, repainting, renumbering and renovation of the Cig fleet commenced. 7327 received the new colours and assumed a new identity in June 1987, becoming 1127. 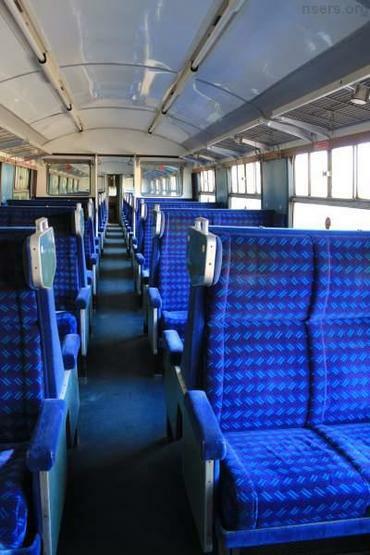 Meanwhile a "facelifting" program was underway at Eastleigh in the early '90s, in which fluorescent strip lighting replaced the tungsten bulbs and new blue-flecked NSE moquette displaced the 1950s designed Trojan pattern. A public address system was installed at the same time and the unique Phase 1 feature of reading lamps built into the luggage racks removed. 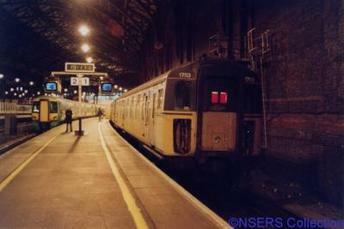 1127 was treated between November 1992 and January 1993, becoming 1753 in the process. Confusingly it was the second Cig to carry this number; former Big unit 2103 had also become 1753 upon loss of its Buffet car - thus creating an immediate recipe for misidentification. A further alteration was the addition of a headlamp affixed to the corridor connection door at each end and following privitisation, a repaint into Connex's bland (and impossible to keep clean) white and yellow livery - its final change of appearance. By now, slam door stock was perceived as antiquated and outmoded - something that was used by Connex as an excuse for their own poor performance, despite the fact that the units were actually far more reliable than almost all modern stock. Connex's lack of care for the fleet was lamentable, units were often filthy inside and out, interior fittings broken or missing. First class was removed at one end of each unit, in the case of 1753, DTC 76102 suffered the ignominity. Damage caused by vandalism was poorly repaired (if at all) and battering ram buffet trolleys added to this further. As luck would have it, 1753 turned out to be one of the earlier withdrawals, before the cull began to gather momentum. This was good fortune as it not only saved it from further abuse with no chance of anything more than essential repairs, but its disappearance passed without interest from souvineer hunters (later withdrawals tended to loose English Electric badges and the like). With 600 miles left until a works exam, it was withdrawn on 5th February 2004. 1753's final trip in revenue earning service was the last Sussex Coast train of the night of Friday 4th February - the 00:05 Victoria to Worthing and Eastbourne, splitting at Haywards Heath. 1753 formed the Worthing portion and upon arrival, ran empty to Lover's Walk, where it spent the weekend. 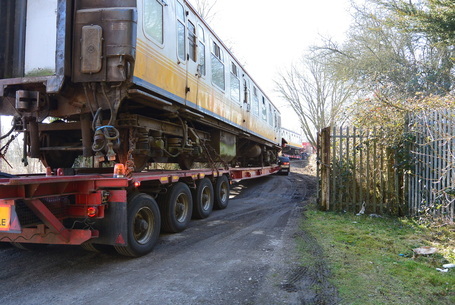 Its last journey under its own power was with sister unit 1744, from Lover's Walk to Stewart's Lane, where shoegear was removed for clearance reasons prior to haulage to MOD Shoeburyness for storage. 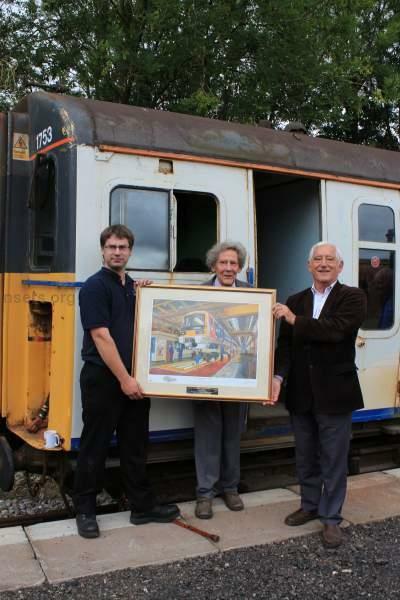 This final rail journey took place on February 18th and a photograph appeared in the Railway Magazine, showing the train at Gospel Oak. Power was provided by 37203.
by an example of one of the most reliable trains ever built - an unsung hero of the railways if ever there was one. ubiquitous and immutable as they seemed, there years were now severely numbered. thus retaining the original blue Formica throughout. This last narrowed things down significantly, since only a mere handful of units were diverted to Wolverton Works. 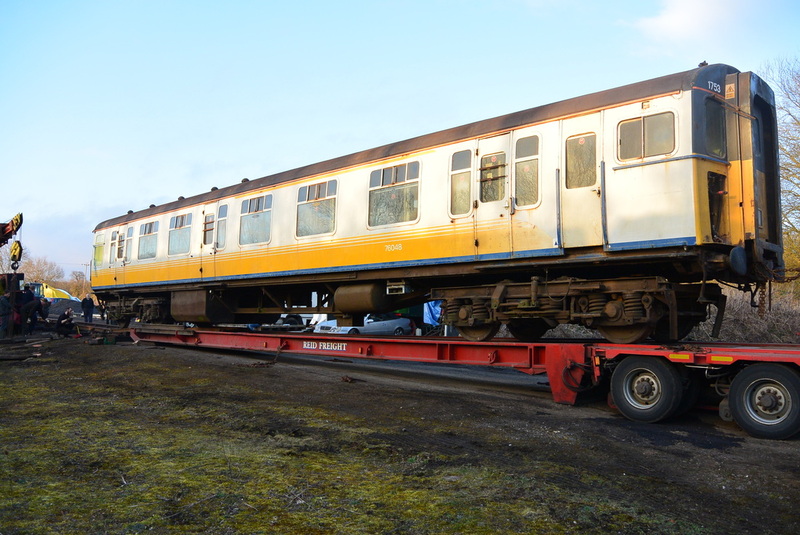 Additionally - after further probings - it appeared that only two of these units retained a matching trailer, the others having acquired substitute phase 2 trailers. So this left a final choice - 1752 or 1753! At that time the former was in much better condition, but 1753 had always been a favourite of Neil's, its ultimate selection was firmly clinched when yet more enquiries revealed that it was still in its original formation, whereas 1752 was not. And so by 2002, 1753 was earmarked for preservation. Angel Trains, the owners of the unit, were contacted at this stage and a good relationship established with their disposals personage - as well as the daunting knowledge that the price was £10,000! Also, as it was a Phase 1, there were considerable implications concerning possible residual blue asbestos contamination (especially as at this stage, no units had been scrapped to prove the efficiency of BR's "cleaning" operation either way). This imposed an increasingly stringent and rigid set of restrictions, but the initial requirement was to either set up a limited company, or join forces with an existing one. that does not necessarily mean that 1753 will perforce end up wearing NSE colours!). First problem seemingly solved, the next item on the agenda was to endeavour to find a suitable home for a Cig - Not easy! Preservation societies do not tend to favour air braked stock owing to loco compatibility problems, plus there was the concern of damage to the unit from misuse or overuse; not to mention the costs involved in operation and the provision of spares. There was also a question of distance, ideally not to far from the south east. Railways in this area seemed to be overwhelmed with stored stock. Of only two railways discovered that were willing to take a Cig, both specified potential contracts that were vastly to their advantage - and potentially financially crippling from our point of view. Both were situated in significantly wet parts of the country - hardly conducive to effective preservation with outside storage, and neither was anywhere near the south east. Alternative options would have to be sought. To cut an exceedingly long story reasonably short, 1753 happened to be one of the earlier withdrawals (February 2004) and as soon as news of its imminent operational demise, Angel Trains' 'phone was avidly ringing! Thus we embarked upon a protracted process, hindered by an increasingly complex array of legalities attached to contractual requirements of sale which became ever more impossible to surmount. On two or three occasions everything pointed to defeat and we were on the brink of seeing all our efforts wasted. Towards the end of the process it seemed that there was no way of meeting the stipulations. Amazingly, at the eleventh hour, it all fell into place. An affiliation with an approved preservation society (albeit not railway related) was secured and the ultimate hurdle of storage was overcome. It had seemed that the latter, with rebuffs from every type of site and landowner would end up as the deciding factor that would see 1753 join her sisters in the scrapyard, but mercifully this was averted. Meanwhile 1753 had spent 10 months hidden away in open storage at MOD Shoeburyness amid the ever expanding ranks of withdrawn Cigs and Veps. 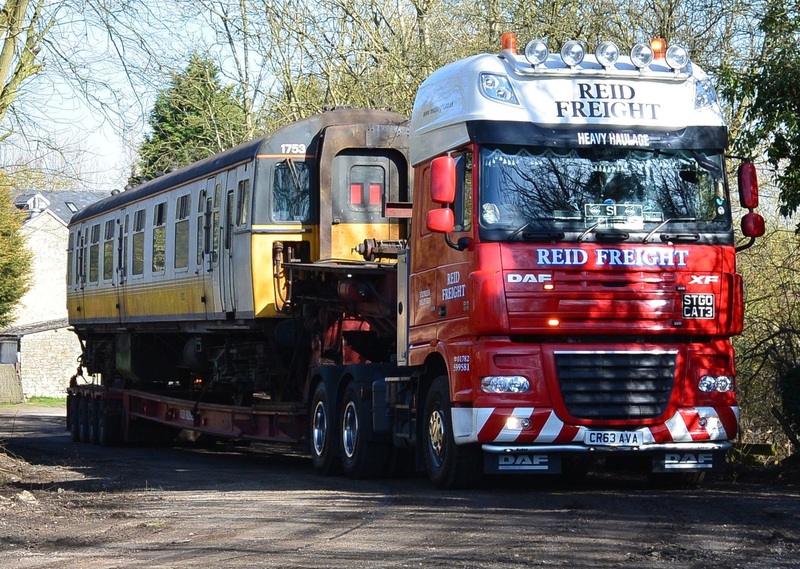 Finally, after nigh on a year out of service, it parted company with the rails for the first time in its four decades of existence and was road-hauled to its new storage site on an industrial estate in East Anglia. And they told us buying it was the easy bit! by force of circumstance rather than choice. the problem is under control and routine spraying should prevent a recurrence. The ultimate aim for the unit is openly ambitious - to restore it to operational condition on the third rail. Far fetched it may seem, but we believe a positive, forward thinking approach is the only way to overcome the prejudices that exist towards the idea of a third rail supply in preservation and we will strive to overcome this defeatist outlook. Other seemingly unthinkable ventures have come to fruition and now reached maturity - preserved locos on the main line, trams and trolleybuses running under the wires at Crich, Carlrton Colville and Sandtoft, 1938 tube stock restored to operational condition and running on the Underground - not to mention the continued existence of the venerable Volks Electric Railway, running along the beach at Brighton. We will continue to draw inspiration from achievements such as these and continue to be mindful of the fact that had we had any defeatist inclinations from the outset, 1753 would no longer exist! Nonetheless, we do have to be realistic and accept that operation is a long-term goal - and one in which we cannot guarantee success. Failing that, another aim is to allot 1753 to a suitable museum project. As it stands, the Southern Electric system has little recognition in museum terms - considering its scale, situation and the vast quantities of passengers carried over the years this seems almost unbelievable, yet the unostentatious efficiency and lack of glamour associated with multiple unit electric traction must account for this, along with the fact that by their very nature, units are more difficult to accommodate than locos. As a complete unit in original formation, 1753 would be an ideal candidate for any collection aiming to redress the balance. Attending to practical matters, we have not neglected the question of spares or 1753. We have been fortunate in being able to amass a quantity of varied items, from seating to arc chute, light fittings, wooden trim, contactors, a motor-generator and even a spare motor bogie. Much of this was consequent upon us negotiating purchase of remaining spares at Brighton Lover's Walk Depot and our gratitude goes to the staff there who took so much trouble to be helpful. We are also indebted to staff at Fratton Depot, who saved various special tools and drawings - not to mention permitting us to raid their skips! Secure storage is rented away from 1753 to house these spares undercover and our next task is to arrange and catalogue them. The existence of these spares, along with tools and technical information will significantly assist us in promoting 1753 as a viable operational proposition. Daunting hurdles lie ahead - yet hopefully not insurmountable. We will continue to consolidate our position within the emerging electric preservation movement and we trust we will win friends along the way as fellow electric traction preservation enthusiasts are persuaded that it is only through cooperation that the movement as a whole will achieve the recognition it deserves. In terms of appearance the Cigs were a tidied up version of the Ceps built from 1956 for the Kent Coast Electrification. Both Cigs and Ceps were based on the standard BR Mk1 coach design, with separate under frame supporting an all-steel body, but the Cigs featured fiberglass cab ends giving a more modern appearance and a different internal layout. More importantly they broke with tradition in having all of the traction equipment under one central motor coach, as opposed to shared between the driving vehicles. 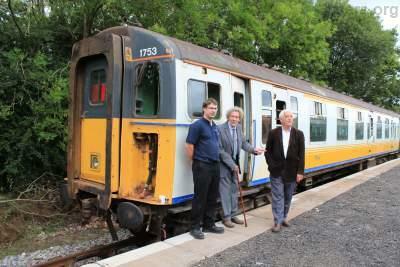 They also rode on the latest B5S trailer bogies although the phase 1 units retained Mk4 leaf-sprung motor bogies. The Bigs were identical but with the trailer car replaced with a buffet. 4 Cigs were equipped with 1963 electrical equipment, based on the 1957 equipment on the Ceps, but with less duplication of items due to the single motor coach. They had the standard 27 way multiple unit jumper connection allowing them to work with any post 1951 SR EMU. Shunt Motors in series, all resistances in circuit. Series Initially as above, resistances removed as the speed increases. Parallel Motors in parallel, resistances initially back in circuit and again removed as speed increases. Weak Field As parallel, but to field current reduced to 53.5% by tapping the field winding part way, thus reducing the length in use. This reduced back EMF and increased balancing speed. In normal operation, the position of the controller would effectively set a maximum that the cam shaft could run up to, with each stage dictated by the speed of the unit. Normal braking was by electro-pneumatic operation, with the brake cylinders supplied from a continuously charged main reservoir pipe via an electrically controlled application valve on each car. Combined with this was a holding valve for releasing the brakes and the triple valve, which admits air to the brake cylinders on reduction of pressure in the brake pipe. Normally, the fast acting and self-lapping EP brake would be used. The driver's brake valve could be moved between run and release (0 PSI) and full service (50 PSI) at will, with a rapid effect on braking throughout the train due to the instantaneous nature of the EP system. An "EP-Auto" switch allowed the use of the automatic brake. This brake vented the brake pipe via the driver's brake valve, thereby operating the triple valves on each car. The slow-moving nature of air meant a delay in applying and releasing the brake, particularly with a long train. Also it was not possible to partially release the brake. The auto brake was retained simply because it was fail safe. If the train divided, the brake pipe would vent and apply the brakes. Passenger alarm cords, the DSD and the Guard's emergency valve also functioned in this way. All control systems and also lighting was fed at 70 volts DC, supplied from a motor-generator mounted under the motor coach. This ran continuously as long as the unit was cut in. The compressor was also mounted under the motor coach and supplied at line voltage via the compressor contactor. This was in turn operated at 70 volts by the compressor governor, which would cut the compressor in as pressure dropped below a pre-determined level. The compressor would only run if a cab was "active", meaning that units could "go flat" if left at a terminal for some time. Heating was at line voltage, direct from the third rail supply. A unique feature of the phase 1 units was their electric parking brake. This acted on the motor coach and was wound on and off by a small motor. Operation was via a switch in each cab, but if power was unavailable it could be operated by winding a dynamo in the brake van. Never particularly successful, phase 2 units (and the Veps, Reps and TCs) reverted to the conventional "screw down" parking brake. The interior of the phase 1 units was similar to that of the later batches mark 1 loco-hauled stock. 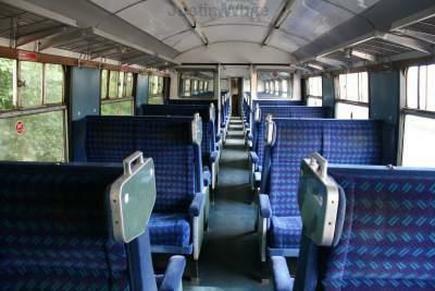 Second Class saloon areas had two a side seating, with deep cushions. "Wings" and armrests were provided at the outer edges of each pair. Moquette was the then widely used Trojan pattern. Wall mounted trinket trays were provided for all seats other than those at door ways, as were clips for attaching a full size table. Side paneling was deep blue laminate, with painted wooden surrounds to the (double glazed) windows. Curtains were fitted and the track covered by a polished wooden valance running the length of each saloon. Luggage racks were provided above the windows and on bulkheads and draft screens, those above the windows incorporating shoulder lights. Main lighting was by 65 volt tungsten lamps in the ceiling - these were closer to the center line than in the preceding Ceps, where it was found they were easily broken by passengers attempting to place items in the luggage racks. The second class compartment seated four each side and was similar to the saloon. First class compartments had three seats per side, which had fixed armrests and had a recline function. a different colour scheme. First Class passengers gained folding armrests, but lost the reclining seats. Phase one units were among the last vehicles delivered in green, with small yellow warning panels within the end gangways. Phase two units were delivered in blue and grey with full yellow ends. All phase 1 units had asbestos insulation removed in the late 1980s. They were later refurbished with new ceilings incorporating fluorescent lighting, public address and new moquette. Most units lost their original blue paneling and wooden valences, these being replaced by cream paneling and stainless steel valancing. Only the eight (of which 1753 is one) completed at Wolverton retained these features. A number of the South Western Division's Phase 2 units were later modified with a second stage of weak field, achieved by way of a shunt. This was designed to improve performance for the tightened schedules on the Portsmouth Direct Line. They were distinguished by being renumbered in the 13XX series and in a nod to the LSWR, were christened "Greyhounds" after Dugald Drummond's T9 class steam locos. Phase 1 Bigs became Cigs through reformations, allowing all Big units to have better riding Mk6 Motor Bogies of the Phase 2s. 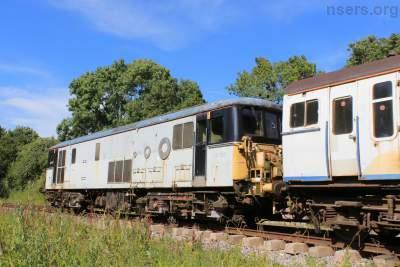 Some units were re-bogied using the Mk6 bogies from withdrawn Reps. These, and several others also had there electric parking brake replaced with a conventional one. 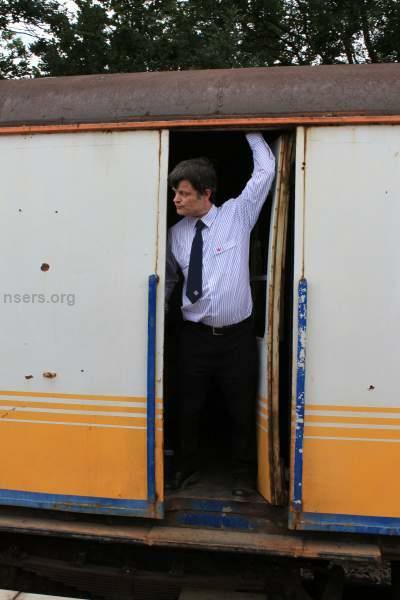 The withdrawal of buffet services under Connex resulted in some Bigs loosing their buffet car to become 3 Cops. 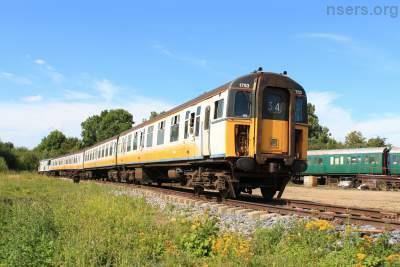 First Class was also removed and the units (theoretically) dedicated to Coastway services. Some later returned to 4 car formation with the addition of trailers from withdrawn phase 1 Cigs. Other Bigs that did not become Cops were leased by South West Trains and had their buffet replaced with a Cep trailer. 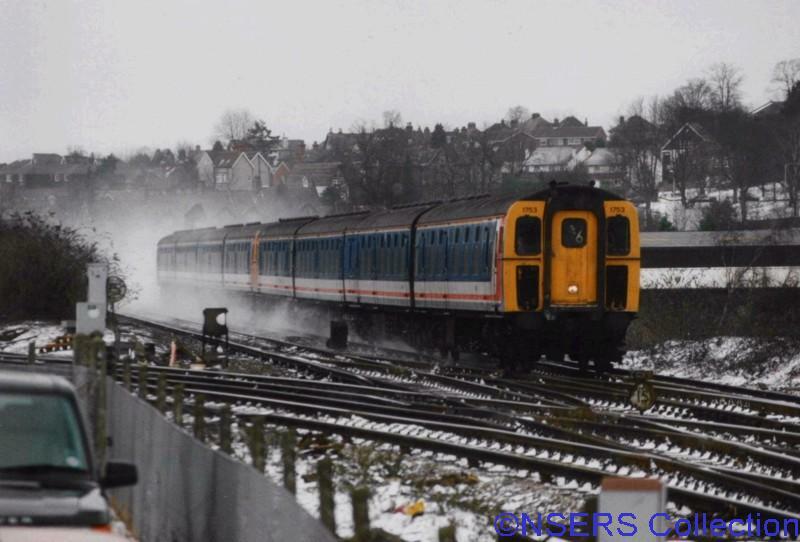 Through the years, the Cigs have worn several liveries, these being BR green, BR blue (briefly), blue and grey, "Jaffa Cake", Network SouthEast (both versions), and the privatised liveries of Connex (also their grey undercoat), South West Trains and Southern. No phase 1 units ever worked for South West Trains. South Eastern was the first to lose their Cigs, ironically replaced by older Ceps transferred from SWT. whilst others went directly to various scrap yards. Most of those stored have since been scrapped also. 1393 - now split up, a DTC is at Kingswood scrap yard for sale, NSERSL own the Buffet car 69339 as part of 1753's project, the MBS has been purchased by RVEL Derby for re-use as a fully converted test coach back in use on the main line for Network Rail and the other DTC has been scrapped. 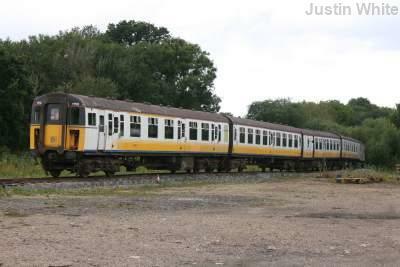 1399 is now in the hands of www.400series.co.uk & resides at the Dartmoor Railway. 1499 is still at the Dean Forest Rly, I believe its either now a 4 or 5 car having 71080 from 1881. & TC 71080 has been passed to the Dean Forest for 1499. Ex Lymington units; 1497 is now at the Mid Norfolk railway - it is about to have ex BIG buffet coach 69304 added in due course. 1498 is now at the Epping Ongar Railway. All items credited to Issie Barrington,Neil Bird, Kevin Gibson and John Day.